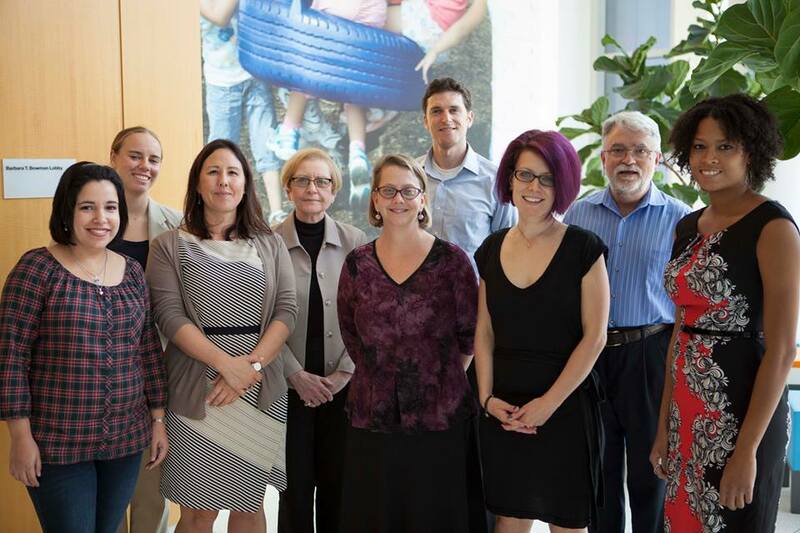 On October 3 & 4, 2013, a small group of individuals representing a few mighty organizations met at the Technology in Early Childhood Center at the Erikson Institute in Chicago, IL. The group (above) included Iara Fuenmayor (TEC Center), Joanna Ison & Aimee Strittmatter (ALSC), Rita Catalano & Mike Robb (Fred Rogers Center), Carisa Kluver (Digital_Storytime.com), Cen Campbell (LittleeLit.com), Chip Donohue & Amanda Armstrong (TEC Center) and Warren Buckleitner (Children’s Technology Review, though Warren joined us remotely). The group got together to discuss an idea that we’ve been working on at LittleeLit for some time now; unified, wide-scale librarian involvement in the children’s digital publishing marketplace. Chip Donohue offered to facilitate our little convention after meeting with Carisa Kluver, Starr Latronica (ALSC President) & me at ALA Annual in Chicago right after the A to Zoo for Apps conversation starter, and during our 2 day meeting in October we discussed the need for children’s librarians to be much more actively involved in developing resources and programming that include new media. Initially my plan was to develop a comprehensive app evaluation, curation and aggregation tool similar to A to Zoo but for digital media, but the emphasis of the project has shifted away from the tool and more toward the training. I do think there is a pressing need for a tool that is populated with data (and metadata!) by children’s librarians, but the development of a large piece of software with buy-in from many different parties seems to require more bandwidth than most of us can handle right now, and there are concerns that the marketplace is changing so quickly, and there are many other “recommendation” projects in existence, that the resources and time it would take to build a truly comprehensive tool may not pay off as well in the long run as the training. I’m working on ways to build the development of a tool into the training materials themselves, though, even if it makes use of existing tools or takes more time to build than we’d initially hoped. In every community library there will be a media mentor who develops early childhood programming that models the intentional, appropriate and healthy use of mobile technology with young children and recommends high quality, age-appropriate digital media as a part of normal reference & reader’s advisory services. The plan right now is to go for an IMLS planning grant to expand on the work we’ve been doing through LittleeLit.com (like individual consulting projects and New Media in Storytime workshops), trainings with Carisa Kluver and the California State Library, as well as Betsy Diamant-Cohen and Mother Goose on the Loose. Through all of these projects we’ve been working toward the development of training resources, the training workshops themselves, and early literacy technology projects within public libraries. For the planning grant we’re seeking partners to both guide the development of the training tools, and partners to act as pilot sites. The cast of characters who are lending their resources and guidance to this initiative is impressive, and I am humbled by the continued outlay of support for what we’re attempting to do. Not only are the aforementioned institutions lending themselves to the project in an advisory capacity, we also have representatives from the Every Child Ready to Read Oversight Committee, the New America Foundation (Lisa Guernsey, who put the “media mentor” idea in my head in the first place) and representatives from other State Libraries and library systems all around the continent offering their institutions and services. I have a few months of heavy-duty grant writing ahead of me, but I have a whole team of experienced and enthusiastic people from libraryland and beyond who see the need for guidance in this area, and who realize the potential of the public library to provide that guidance to families and educators who are struggling with managing and using new media with their young charges. The project is still in its infancy and I am working on details about who is going to do what. All we know is that librarians are finally stepping up to fill a very big void, and if we get funded, we’re going to do it nationally. Many thanks to everyone who joined us in Chicago, especially to Chip & Amanada, our gracious hosts. I look forward to future discussions, preferably where no one gets sick! Posted on October 21, 2013, in collaboration and tagged ALSC, California State Library, Children's Technology Review, Digital Storytime, Every Child Ready to Read, Fred Rogers Center, Mother Goose on the Loose, New America Foundation, TEC Center at Erikson. Bookmark the permalink. 2 Comments.